Conceived initially as a part of the London based collaborative event by the Mews Project Space 'Artists books Weekend' “What is an Art Book?” is an investigation in to the politics of artists books, its mode of production and its recent resurgence in the art world. For this our third volume The Modern Language Experiment is very excited to be collaborating with two New York spaces. Garis & Hahn and Young & Starving. An Art Book today can be seen to occupy various different positions including that of a piece of theory, a catalogue, a printed exhibition, a piece of art in itself, a supplement to a pre-existing piece. It can be a proposal for the future or an examination of the present or what has passed. 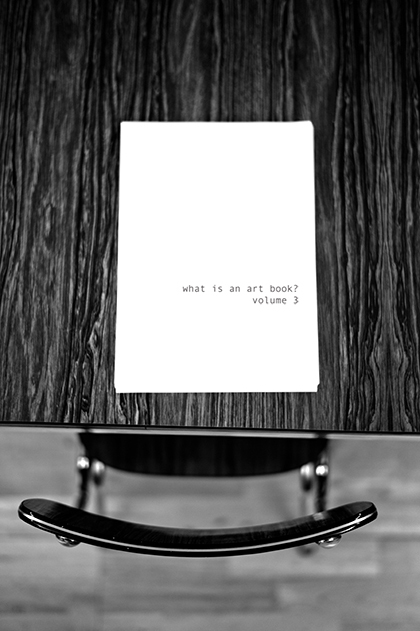 “What is an Art Book?” will be an investigation of what an Art Book is in terms of material, conceptual, industrial and political concerns. Over 50 artists, writers, curators, and other practitioners are invited to respond to the title of the project by contributing their interpretation of what an Art book means to them and their practice. Each contributor can propose text, drawings, photographs, sculpture, performance, audio recordings, video or any other concept/theory as long as it can ultimately be realised in A4 paper format and in black and white. The contributors will produce their artworks over the three days at Garis & Hahn, which will serve both as an exhibition space and a production house where we will create the actual artists book. The finished publication will then be sold locally in NYC and in London.